2019 have brought me the chance of participating in blog tours hosted by the lovely Rachel and this is the first book of a few before the summer! The posts for the blog tours will look slightly different than my regular posts, meaning that the featured image will be different, there will be some info about the author at the bottom of the post, and also info about where you can find the author online, so keep your eyes peeled in the future! 1973: Cecilia ‘CiCi’ Freemont is looking for adventure in her young life. With a restless soul and the voice of an angel, her main dream is to become a famous singer. She has dropped out of college and thus disappointed her parents, and now she finds herself without money stranded with a hippie group on a beach on Maui. 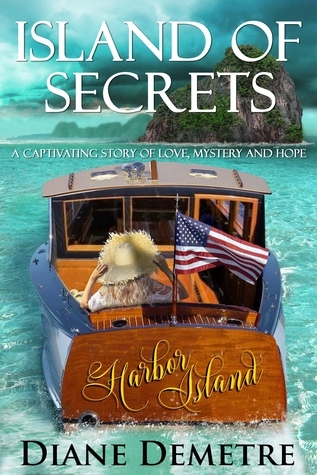 When the opportunity of embarking on an adventure containing a new job, an exotic island, and opportunities she doesn’t expect, Cecilia cannot resist. 2017: Tina Tempelton inherits Harbor Island to her own great surprise. This puts a sudden stop to her career plans. The job of managing the island is greater than she ever expected it to be, even with the help of a cabaret singer named CiCi Freemont. An ecological threat to the beautiful beaches of Harbor Island doesn’t make the job easier for Tina, and she needs the help of the US Coast Guard. Island of Secrets is a book that involves two love stories separated in time, yet intertwined. I enjoyed that because I always enjoy reading stories separated by time and then I try to tie them together on my own before the book spoils anything. I have to say that there were a few plot twists in this book that threw me off, so I didn’t manage to piece it all together. The thing with these plot twists is that when you read the book you’re so sure that you have it all figured out and then, no, no you didn’t. It’s done in quite a clever way which I enjoyed. In my opinion, it is refreshing that the book includes thematics from the 21st century. Island of Secrets was published in October last year (so weird to say that still), and I think this book enlightens the environmental issues we’ve seen thus far in the century, and probably, sadly, will continue to see in the future. On that note, I liked the way this book was written. It was easy to read with some shorter chapters and some longer chapters. The nice thing was that the longer chapters didn’t seem long, because they often contained key information related to the story. What really made this book worth the mark I gave it was the secrets hidden in the storyline. It’s not always clear which secret is the main one, and this makes the reading experience better in my opinion. The way the characters talks about the secrets also makes it even more enjoyable and difficult to discover which secret is the main one. Speaking of characters, I particularly liked the elderly version of Cecilia and how you were able to see the younger version of her shine through. This, in my opinion, created a nice circle to the entire story and made it seem more wholesome. Island of Secrets was a good book, although it won’t be a favourite. However, I would recommend this book if someone were looking for a relaxed and easy read with some action. I think Island of Secrets is very suitable if you want to dream yourself away to a nice, soft beach filled with sunlight and waves lapping at your feet.